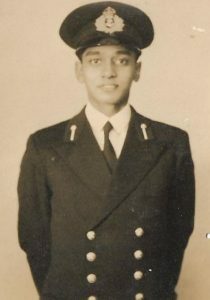 I joined the Indian Navy in 1949 after graduating from Presidency College. It was still the Royal Indian Navy. It is November 1949. A batch of youngsters including myself, from across the country, lands up at HMS Venduruthy. The Royal Indian Navy’s premier training establishment at Cochin1. We are selected as officer cadets and are in Cochin for initial basic training in drills, seamanship and physical exercises and for kitting up in naval uniform prior to proceeding to the United Kingdom to be trained by the Royal Navy. The 6 weeks at Venduruthy pass fairly quickly. The wives of the Royal Navy’s officers who are on loan to the Indian Navy, also do their bit in helping and advising us on English manners and customs-how to tackle the crockery and cutlery at meals, the do’s and don’t’s of social behaviour and so on. Examples of polite conversation? Never talk about health and politics; instead start the conversation by talking about the weather, their morning walks with the dog, pets like cats and birds at home and about cricket and rugby. The cadets board the P&O liner, Maloja at Bombay in mid-December. We are bunked in one of the lower deck dormitories. Everything is new and a bit confusing-salt water bath, strange typical English style food, not to everyone’s taste. The 3 weeks on board is good fun and enjoyable with a variety of games and activities, music, cinema and competitions to keep us all entertained. A large number of English and Australian families were returning home and their friendly and spontaneous behaviour add to the fun, frolic and camaraderie on board. The first impression of England in mid-January 1950 is a rather dismal one. 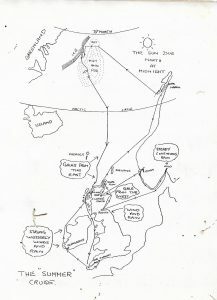 With heavy clouds overhead and a steady drizzle, Tilbury, the commercial harbour of London, some 30 miles away, is buzzing with activities-loading and unloading of cargo, cranes operating noisily and a heavy, suffocating atmosphere in a grim and dirty environment. In sharp contrast, at 55 Jermyn Street, The Office of the Naval Advisor to the High Commissioner of India, UK, we are welcomed by a young, suave and smart gentleman, Lieutenant Peter Mathur, who attends to all our immediate necessities. The next morning, after arrival in our brand-new blue uniform, we travel by train to the Royal Naval College at Dartmouth. The town is on the banks of the river Dart on the south-western coast. Here, we come down to earth, don rough working clothes and join other Royal Naval cadets and a few cadets from other Commonwealth countries. Under strict supervision, dormitory call in the morning is followed by PT and swimming in the buff2. Breakfast and other meals are wholesome. The meal arrangements in the dinning hall for about 200 cadets, are supervised by Mrs. Bullock, a portly and cheerful lady, who at times is at her wit’s ends to arrange vegetarian food for some of them. Classroom instructions are interspersed with practical work on seamanship and boats; we are introduced to hitherto unknown subjects like anchor-work, rule of the road at sea, navigation and communications and a spattering of weaponry like gunnery and torpedo. 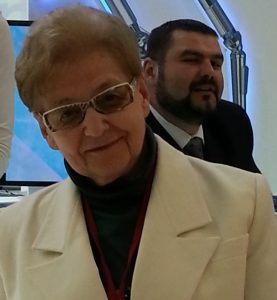 Strict discipline and obedience is grilled into us constantly-close crop haircut every week, spick and span uniform at all times, writing weekly letters home are some of the musts. The day is 20th of January, 1950. Cadets are out for the boat sailing practice on the river Dart. Alas, disaster strikes. The prevailing strong wind and an equally strong current, coupled with the inexperience of the cadets, pushes one boat (I was on the boat) aground on the sand banks of the river. We shiver and feel miserable in the cold wintry evening till the tide changes and the boat mercifully clears the sand bank and floats again. At the end of term, cadets go on a 4-week holiday. Many English families offer invitations to the cadets to spend a few days as their guests. I land up at Bridge of Weir, a small village near Glasgow in Scotland. The hostess, Lady Duncanson and her daughter Anne, are friendliness and grace personified and with their manners make me totally at home. I have the most enjoyable holiday and cannot thank them enough when the time comes to leave. On a bright and sunny morning around June/July 1950, HMS Devonshire, the Cadet’s Training Cruiser, a 3-funnelled ship of vintage reputation is berthed at Plymouth harbour. The ship already has 100 cadets of the senior batch, a highly dedicated training staff of officers and ratings (as the sailors are known). The newly arrived cadets lose no time in settling down -stowing their luggage, learning how to live in close quarters to slinging hammocks for sleeping, and a host of other things. Soon we get down to load the ship with dry and fresh rations and other necessities for a long 3-month summer cruise. Soon Devonshire is ready and sails to Glengariff in Ireland and Lossiemouth on the north-west coast of Scotland. Brief halts and off towards Iceland! The weather turns grey, overcast and bitterly cold. In this climatic condition, scrubbing and washing down the wooden upper decks, bare feet and with ice-cold sea water is no joke. Cadets are also assigned, when the ship is at anchor, to clean and paint the masts, funnels and the ship’s sides. We then head towards Norway, pass the Sor Fjord and enter Oslo. The capital city is picturesque and a busy commercial port with plenty of attractive sights to admire. His Royal Highness King Haakon II pays a visit to the ship and is received with full ceremonial honours and a gun salute. We then return to Rosyth and Scapa Flow in Scotland, and amidst gale, strong wind and rain, head to Narvik, a war-scarred port of Norway still showing the ravages and destruction of the World War. The next port of call is Loch Ewe and then towards Iceland, with lots of mist, fog and artic weather. Soon, we are in the land of the midnight sun, and the experience is unforgettable. And then we return to Loch Ewe before visiting Torquay on our way to home port, Plymouth. The summer cruise is over, and we are off to four weeks leave for rest and relaxation before embarking for the autumn cruise. After the usual settling down and storing ship, Devonshire sets sail from Plymouth for the Mediterranean cruise, traversing the always turbulent and rough Bay of Biscay before anchoring in Gibraltar Bay. A very small strip of land joined to mainland Spain by a narrow isthmus, this Crown colony is historically and politically a very important port. It has a splendid and well-equipped harbour. The next port of call is the beautiful city of Naples and the nearby seaside resort of Sorrento. Across the Bay one can see the cone of Vesuvius, perhaps world’s best-known volcano. In sunny pleasant weather and calm seas, the ship now approaches Greece and anchors off Athens. Five years after World War II ended, the destruction and ravages of the war is still visible around large areas. Countries in this area still suffer from shortages of many essentials including food; a bar of chocolate or a packet of cigarette fetches a variety of curious and attractive items. Devonshire now sails towards Turkey and anchors off Istanbul. Throughout the two terms on board the cadets have been honing their skills continuously. Our 8-month long association with the grand old ship comes to an end. We are to be promoted to Midshipmen on 1st January 1951 and are to continue our training in fleet ships. It is 1 January 1952. After one year of strenuous cadetship, we are now Midshipmen. Our pay/pocket money jumps from 2s.6d. to 12s and we are on top of the world. We change our London abode from Bernhard Baron Club to nearby Frobisher Court Hotel, which has better facilities, enjoy an Indian meal at either Veeraswamy’s or Shafi’s, the only two Indian restaurants in central London, go for a show (A Street Car Name Desire or South Pacific) or queue up at Lyon’s Corner House for self help meals at about 5s or so. Most of us Midshipmen are posted to Home Fleet ships. There were aircraft carriers, Indomitable, Implacable, Indefatigable and the battleship Vanguard. I am appointed to the carrier Indefatigable and join ship at Weymouth3. This ship does not fly aircraft and is a training ship for sailors. There are a few other Mids onboard and I try and find my way in this huge ship. During my stay on board, Indefatigable sails only once to Gibraltar and back. I am assigned the duty of running the liberty boats. One evening whilst approaching the jetty, I put the kitchen rudder tiller the wrong way and hit the jetty squarely. My misery is compounded with the snotties4 nurse Lt. Cmdr. Prescott-Decie watching the incident from the jetty. No dressing down on the spot, no reprimand back on board but my shore leave is snapped for a week. The time on board is not very exciting. Not much organised training and we are expected to be mature enough to do private self-tuition, and hence, inevitably plenty of scope for chatter. 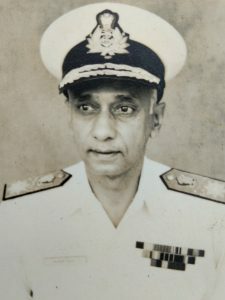 Rear Admiral Subir Paul lives in Kolkata.